Senator Vim Kochhar would like it known that he would have supported the government's Senate reform plans. He believes, however, that certain measures could possibly be amended at committee. He told The Huffington Post Canada on Wednesday that he is a "team player" and has always supported the government's agenda. 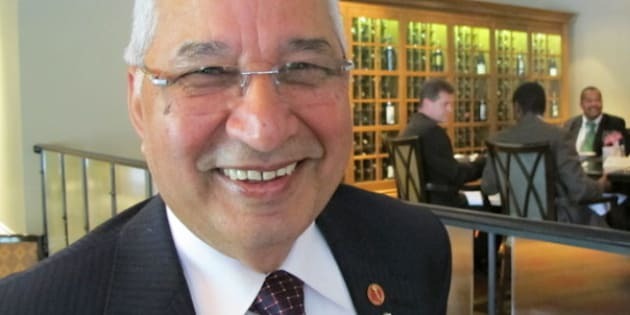 Less than two years after being appointed to the upper chamber by Prime Minister Stephen Harper, Senator Vim Kochhar retired Wednesday having reached his 75th birthday and delivered a sharp assessment of the Conservatives' plan for Senate reform. Kochhar, who was sworn in as a senator in March of 2010 at age 73, doesn't hide the fact he would have liked to stay in the job longer. "I personally would like the age (limit) to be scrapped, I think it is discriminatory," said the senator, who is better known for his charity work with paralympic athletes. "There should be a different criteria for retirement," he told The Huffington Post Canada about the Senate's mandatory retirement requirement at age 75, a change made in 1965. Healthy senators should be allowed to serve for a longer period while those on extended sick leave should step aside, Kochhar said. "If you are not in a good health, you should not stay there, but if you are in a good health and you can contribute, I think you should have more opportunity to contribute," he said. "People go on sick leaves for two years or a year -- that is not right," he said. There should be a health criteria and attendance should be a factor, he added. "Maybe it should be 80...People are living five or 10 years longer on average than they used to live 30 years ago when that bill was passed." Kochhar told Huffington Post he is also unsure a fully elected upper chamber is the right way to go. "I think when you go to all elected senators, it may be perceived to be more fair but (it is) not necessarily better for the second sober thought," he said. Citing colleagues such as retired Senator and renowned heart surgeon Wilbert Keon and retired Lieutenant-General Roméo Dallaire, Kochhar said there are a lot of senators making huge contributions who likely wouldn't run for the job they currently have. "I don't think they would run for an election but they are top of their field and are contributing so much of their time and energy devoted unselfishly to the country," he said. "There are a lot of people in the Senate who are not 100 per cent partisan. In the House of Commons, everyone is partisan, but in the Senate there are people who are really trying to do what is good for the country ... And they have a different way of thinking about it ... that is valuable." Kochhar concedes he would not have competed electorally to win his seat. "I would not. Definitely. I am not a political animal. In the sense that if there were elections, I would never have participated. I tried once and I found out that if you lose in politics by one vote you are a loser and in charity work, which I got involved in, you raise a dollar and you are a winner," the senator said. Kochhar said he also doesn't believe the Conservatives can unilaterally change the structure of the upper chamber. "It is going to need a constitutional change because without the approval of the provinces, you cannot change the constitution and the election of the whole body. So I do not know eventually how it is going to play out," he said. "There are a lot of questions that have to be articulated to move forward." Kochhar does, however, agree with the Prime Minister's plan to impose a nine-year term limit for senators -- "as long as they don't put an age limit." "If you cannot accomplish what you want to do in nine years, you will never accomplish everything because your focus changes after a period of time and your enthusiasm changes after a period of time. I think nine years is a good term limit for a senator," he said. "You don't have to totally agree with everything that is introduced," Kochhar explained, about the need to support government legislation. "(The Senate bill) will be debated and it will be reformed when it comes to a committee. We would have done more input in it," he added. Kochhar acknowledges he wasn't a member of the Conservative Party when Harper called to offer him a Senate appointment. In the early 1980s, he was active with the Progressive-Conservatives, but stopped partisan activities in 1986 to focus his attention on his charity, Canadian Foundation for Physically Disabled Persons, and to organize events to raise money and awareness for disability issues. "I think in my own lifespan working for disability for the last 25 years, the changes that we have brought out in the society and the elevation of paralympic athletes and deaf blind people who can live in dignity and in normal life have been phenomenal. When I started in the movement, it was 'crippled children,' 'crippled civilian,' 'mentally insane,' you know, it wasn't 'mentally challenged' or 'physically disabled,' there was no dignity to it. You hid them in the family, you were not proud to expose them to the society," Kochhar said. "Things have changed ... people lead really full lives. Those are the kind of things that give me a lot of happiness ... That I have been a part of this system (and helped change) the way Canadians think about disability." It was because of that work that Harper appointed Kochhar, a man who has no direct experience with disability but who embraced the cause when he learned more about it, to the Senate. "I have criteria for accepting positions: first, I have to enjoy them; two, I have to give 200 per cent of what is expected of me. And three, I only join organizations that are faltering," Kochhar said. He's not talking about the Senate but rather his new project, Toronto's Variety Village, which was almost bankrupt when they asked Kochhar for help. Although the Senator from Ontario will no longer have a platform in the Senate to push his agenda, Kochhar said he still has a lot of work to do. He wants to equate Paralympic Gold to Olympic Gold in the public's mind. "We are not there yet, but I hope in my lifetime we will." Kochhar was born in what was then Lahore, India on September 21, 1936 (The city became part of Pakistan in 1947 when British India was partitioned). His father was a biochemist who worked as an analyst for the Indian government and taught at a medical school. His mother was somewhat religious. In 1948, when he was 12, he witnessed the assassination of Mahatma Gandhi -- his hero. "I came the first day to get his autograph but I couldn't get near him because of the big huge crowd," Kochhar recounted. "So the next day, I went about an hour or an hour and a half earlier so that I could get near to the stage and get his autograph. When he was coming in from the ashram, where he was staying, to the prayer ground and he was just in front of the stage, a guy who was standing right in front of the stage, bent down to touch Gandhi's feet and he pulled out his gun and shot him. Three times," Kochhar said. "I remember that very vividly. How can you not? You can't forget an event like that." The event marked him for a long time. He still has the autograph book he brought to get Gandhi's signature -- although he never got the signature. Gandhi's philosophy of non-violence and leadership by example was inspiring, Kochhar said, but it is not the leader of the Indian independence movement whom he credits for encouraging him to help others. When Kochhar was a young student at the University of Texas, he hitchhiked to California and spent his first summer picking peaches. Although his family was relatively well off, Kochhar needed to work to pay for his tuition and room and board. That summer in 1955, Kocchar befriended an elderly gentleman named Joe who taught him how to pick peaches quickly. "In those days, they gave you 14 cents for a box of 40 pounds of peaches that you picked. If you didn't pick fast enough you wouldn't make any money," Kochhar recounted. "He taught me how to pick fast and don't start eating peaches because by the time you finish eating one peach, you could be picking up half a basket." Kochhar thought Joe looked "like a hobo." He appeared to live in camps on a perpetual basis. "He had no home, no children and no family. He just worked from farm to farm," Kochhar recounted. When the summer ended, Joe handed Kochhar an enveloped. In it was $1,000 cash. Kochhar was shocked. Joe explained he chose a student every year and did the same thing. "He thought I was working very, very hard to make money so I could go back to university," Kochhar said. At first, he didn't want to accept the cash, but Joe insisted and Kochhar thought he might need the money so he took it. Soon after he had returned to Texas, he found a full-time job working in a factory making refrigeration and water-cooling equipment. "(I worked) from 4 p.m. to 12 a.m. and I went to school from 8 a.m. to 12 p.m so I returned (Joe) his money. And he sent me the cheque back," Kochhar recounted. "He said, 'I don't think you understood why I gave you money. I did not give YOU money. I gave it to a needy student who would be doing good for the country or for his future. I am surprised that you can't find somebody else to help in the same manner. And he returned the cheque. From then on, I got his message very very clearly," Kochhar said. He went to the dean of the engineering school and asked him to find two students who might need $500. Kochhar went on to work as a chief engineer for InterContinental Hotels around the world. In 1965, when he was living in Singapore, he decided he had enough of living out of a suitcase. He wanted to return to the U.S. and put down some roots. He went to see the U.S. ambassador who told Kochhar he could fast-track his application and make him a citizen in two years. Kochhar walked down to the Canadian High Commission, where the High Commissioner told him "Son, as far as I am concerned you can go this afternoon. He said you are more than qualified, we need people like you in Canada," said Kochhar. "So I came to Canada." He arrived in Canada in 1967 and, ironically, a few days later his American papers came through. Kochhar didn't become a Canadian citizen until 1974. Kochhar worked as an engineer on several medical buildings in Canada and later for the Howard Johnson hotel chain. In 1972, a friend he had lent money to skipped town, leaving Kochhar with a used good store. "He left the country with a girlfriend to go to Hungary and left me with merchandise of about $3,500 in retail value and I took that junk store on Queen Street, 204 Queen Street West (in Toronto), and built it into a fairly large manufacturing and retailing business." The business 'Early Canadian Furniture' boomed and allowed Kochhar to invest in real estate. In the early 1980s, Kochhar received his first introduction to politics. His neighbour, former Governor General Roland Michener's nephew Bob, asked him to join the Progressive-Conservative party so he could get his vote at a nomination meeting to select delegates for the 1983 leadership convention. Kochhar told Michener he wasn't a "politician," didn't like politics and didn't want to join a party. But Michener said he needed his vote, so Kochhar bought a party membership and was even convinced to run as a delegate. Kochhar gave a short one-minute speech talking about immigrating to Canada, how the country "was the greatest country in the world and how it has been good to me, to my family." He made such an impression, party heavyweights asked him to run for the Progressive-Conservative nomination in the Toronto riding of St. Paul's against Barbara McDougall. He lost but became McDougall's fundraising chairperson. Then other PC candidates came calling for help. "When you are involved in politics and you are successful in fundraising, everyone wants you," Kochhar explained. He even fundraised for a brief period for former prime minister Brian Mulroney. (He has never raised any money for Harper). That all stopped, however, when in the mid-1980s, a friend ask Kochhar to help raise some money to build housing for people with physical disabilities -- he had found a new calling. His friend was hoping to raise $10,000. Kochhar decided to organize a gala, but soon found out it was very difficult to sell "just disability itself." "I had heard that our athletes have brought home 222 medals from the sports for disabled -- there was no Paralympics in those days. And it was the best-kept secret in Canada. Nobody knew about it. We were second in the world and nobody knew about it," Kochhar said. "So I thought it would be a good hook to recognize these athletes." The first Valentines Gala was held in 1985. To Kochhar's surprise, they raised $239,000. The next year, the Great Valentines Gala raised $300,000. It's been a fundraising success ever since. "To be honest with you, I got addicted to it more than anything else. And I thought jeez, this is a really good thing to do," he told Huffington Post. Since his first two galas were for people with disabilities, he kept along the same path. The next year, he hired Bob Hope to perform. Hope's appearance fee was $75,000 and Kochhar said the Rotary Club's board of directors went berzerk. He paid Hope from his own pocket and the event raised more than $900,000. "From then on, nobody could question me and how I wanted to proceed with the foundation. And I have been there since 1985, running the show and we have raised over $26 million so far." Kochhar has been involved with the Canadian Helen Keller Centre, setting up the Terry Fox Hall of Fame, establishing the Why Not Marathon for the Paralympics and Rolling Rampage, a race for wheelchair athletes that moved to Parliament Hill this spring. Kochhar told Huffington Post he's proud of the time he has spent in the Senate, especially a study he initiated in human rights committee that revealed how little money is given to athletes with disabilities. He is hoping the Rolling Rampage event will be more successful in Ottawa than it was in Toronto, although this April few parliamentarians came out to support it because MPs were busy pounding the pavement during the federal election. "I was there 18 months and 18 days," he said of his time in the Senate. "It's like turning a page, I'm writing the next book now," he said Tuesday about his upcoming retirement from his office in Toronto. "The next book, I just try to do a better job with what I was doing. I have a foundation, I'm working on the Museum of Human Rights, I'm working with Variety Village, I;m the chair of the Canadian Paralympics Foundation ... we have disability hall of fame event coming up (and) I'm coming back to Parliament Hill Monday." Kochhar will be back on Parliament Hill next week -- but as a visitor -- when the Senate reconvenes for its fall session on Sept. 27 and his colleagues pay him tributes. The current dean of the Senate, Senator Lowell Murray, is also resigning at the end of the month. Murray was appointed to the upper chamber in 1979 as a Progressive-Conservative and has refused to join the Harper Conservative caucus. Murray, a well-regarded senator, has also spoken out against the Tories' Senate reform plans saying they are ill-thought out and would create more problems than they would solve. Harper's spokesman Andrew MacDougall confirmed to The Huffington Post Tuesday that the government plans to appoint new senators to fill four seats that will be soon be vacant. "(There is) nothing to announce now. Appointments will be made in due course," he said in an email.